100% natural soap. 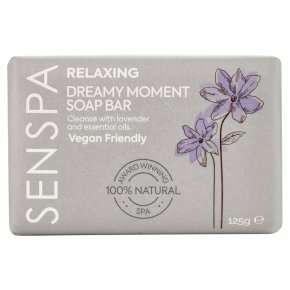 With lavender & essential oils of berganot, patchouli & geranium.Senspa Relaxing Organic Soap combines organic lavender, palm and coconut oils with an exotic blend of bergamot, patchouli & geranium pure essential oils. A really rich and creamy formulation that leaves your skin feeling cleansed, moisturised and nourished. Directions: Use within warm water to create a luxurious lather.